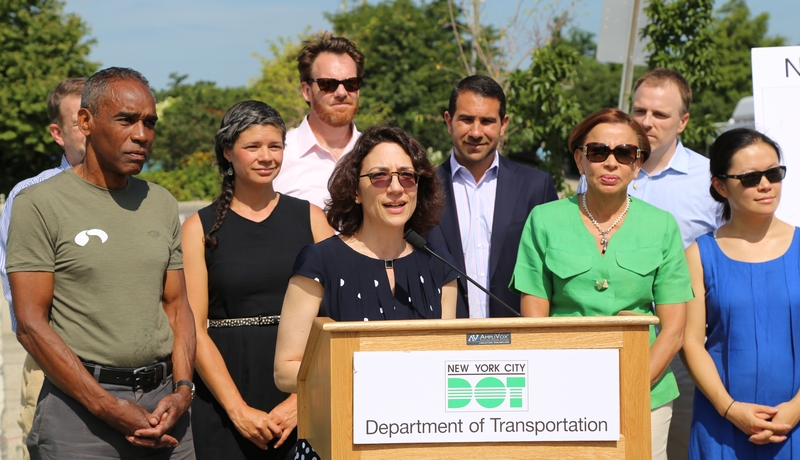 New York City Department of Transportation (DOT) Commissioner Polly Trottenberg and Brooklyn Greenway Initiative (BGI) today stood along the Brooklyn waterfront, announcing that BGI had been named the inaugural partner in DOT’s Adopt-a-Greenway program. Commissioner Trottenberg also invited organizations and businesses from across the City to consider becoming a greenway maintenance partner or sponsor. Maintenance partners commit to manage maintenance of individual segments of greenway space, with sponsors underwriting the upkeep. With only minor sections still under construction, the Brooklyn Waterfront Greenway now extends from Greenpoint to Red Hook, about six miles along Brooklyn’s East River waterfront. Today’s announcement underscored DOT’s intent to develop this program well beyond Brooklyn throughout the City’s growing number of greenways and public spaces. The Adopt-A-Greenway program¸ launched in November 2015, is an opportunity for New Yorkers, companies, or organizations to give back to their community through a tax-deductible donation that ensures clean and beautiful pedestrian and bicycle paths in New York City. Brooklyn Greenway Initiative is currently the Maintenance Provider for six separate segments of the Brooklyn Waterfront Greenway, and will agree to maintain and beautify the corridor by performing tasks that include litter clean-up, landscaping and snow removal. Additional greenway segments along the Brooklyn Waterfront Greenway are available for adoption. As DOT plans to expand the program into other boroughs, we encourage civic-minded organizations and individuals interested in the opportunity to enhance New York City's greenways to become sponsors. To learn more about adopting Greenway segments, please visit the Adopt-a-Greenway page on the DOT website, www.nyc.gov/adoptagreenway , or by contacting adoptagreenway@dot.nyc.gov.